Starting from next week, I am going to provide add the USD/CAD forex pair to my daily review (Sunday to Thursday, for the next trading day) and my weekly review (on Sundays). I hope you appreciate the effort and such review is useful for your trading. Also my last review for the USD/CAD pair is dated March 10th, 2013 so it was long due for an update (I don’t actively trade the US Dollar versus the Canadian Dollar, but I will now start reviewing it regularly). The USD/CAD is in a long-term bear, with ‘recent’ resistance showing on the weekly chart at the 1.0560 area. This resistance area was tested in the second part of 2011 and has a target below into the 0.88 area. This is the long-term target for the USD/CAD if we get US Dollar weakness as anticipated. On the daily chart we have a sequence started at the end of September that failed recently and the market showed it’s first leg downwards in the last two weeks. If we get a retrace higher this market could be entered short at 1.0270 or 1.0290 with a stop above 1.0325. Check my newsletter on Sunday for the exact levels and a clear trading plan. There is a major difference on the daily chart which can be spot analyzing the two charts compared above. Price action of both charts is the same but; while the Euro failed the next move higher, showing a Euro that is going to weaken faster than the Japanese yen in the coming days,that did not happen to the USD/JPY. So that means that bulls are not interested too buy the EUR/JPY pair at this stage (see below), while they could still be involved in long positions in the USD/JPY pair. The USD/JPY pair (see picture above) did not fail the current long extension setup. Above the 91.60 level longs are still valid with a 1st target at the 94.90 area (scenario 1). 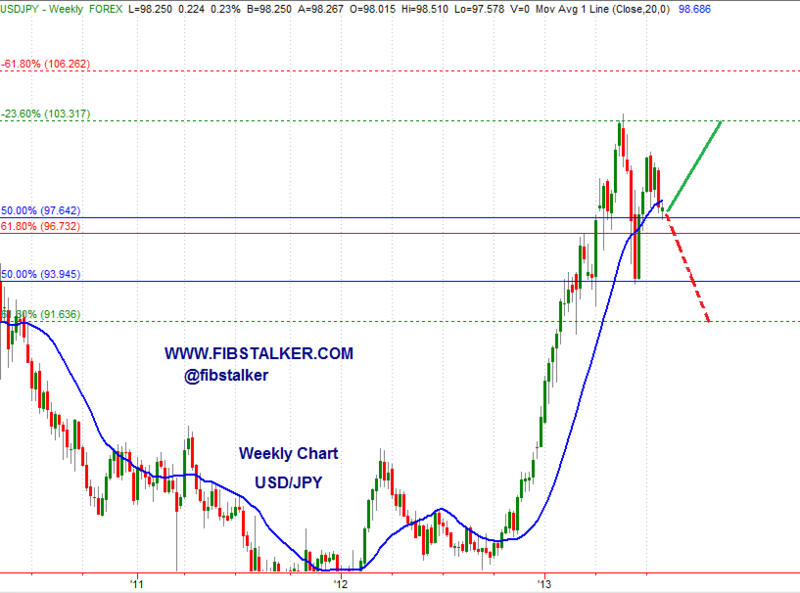 The scenario 2. for the USD/JPY would develop if price falls below the 91.60 level. In that case we could see a move into the next level of support down at the 89.40 area. 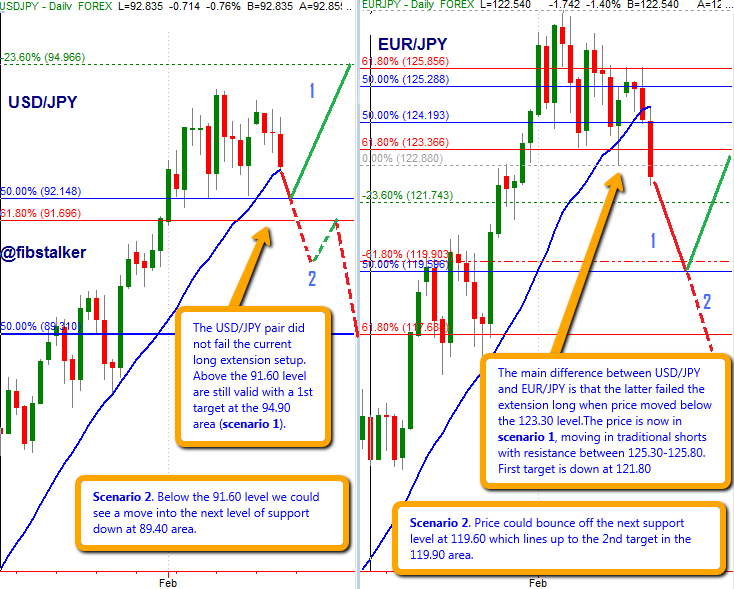 As anticipated, the main difference between USD/JPY and EUR/JPY is that the latter failed the extension long. That happened the very moment price moved below the 123.30 level on Friday last week.The price is now in scenario 1, moving in traditional shorts with resistance between 125.30-125.80. First target is down at 121.80. Scenario 2 would kick if price would not bbounce off the next support level at 119.60 which lines up to the 2nd target in the 119.90 area. In that case, we could see a continued move lower. The level of support on the EUR/JPY pair will be identified when the EUR/USD pair will also find support. I anticipate this support will come at 1.2900. Both USD/JOY and EUR/JPY could find their support when that happens. In my mid-week update I will send tonight I will have a video on this analysis and more information. A quick update on the USD/CAD because I think it could have already started an interesting move lower. But I also think there is still the possibility to participate in it. The 1.0030-40 area is a significant resistance area for the USD/CAD. 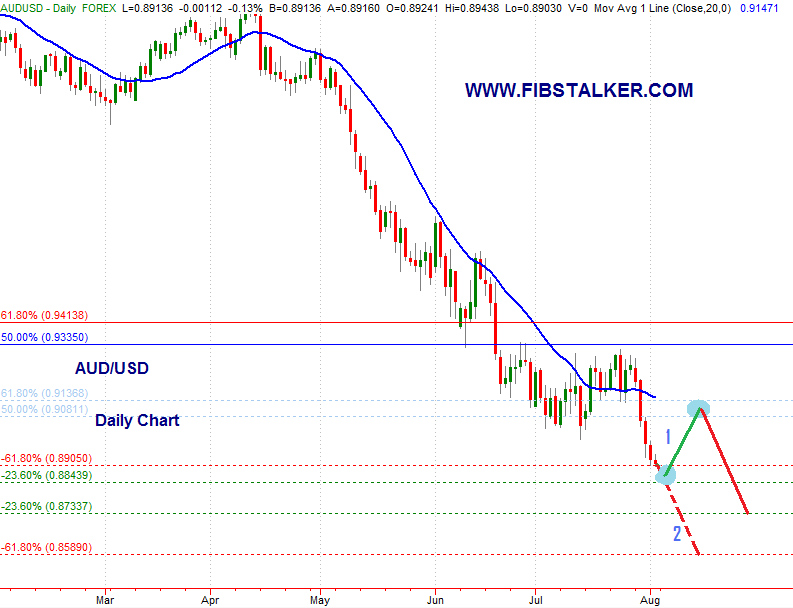 In case of renewed Dollar weakness we could see a move lower, into 0.9960 at least. Scenario 2. Price moves into the 1.0010 support area and moves higher into the 1.0030-40 resistance again. From there the move lower can start. The initial target is the same 0.9960. Notice that the big 1.0040 resistance level has targets below at the 0.94s… Tomorrow I will record a video in which I will analyze the 4-hour chart as well, and will post it on the Blog. A good short opportunity is unfolding here. Please let me have your thoughts. Thank you.